In line with the launch of the Speedmaster Professional Moon Phase model, OMEGA presents a special series of unique skeletonised versions. A mere 57 such models will be produced (in allusion to the first-ever Speedmaster model, launched in 1957) using the most precious of materials. Produced in-house by the master watchmakers at OMEGA’s top-of-the range manufacturing cell, each piece is totally unique and constitutes one of the ultimate Speedmasters. The watch case and bezel are in platinum, the dial is silver with a yellow gold base, the hour markers in blued gold and the hands in blued steel. A sapphire crystal is used for the watch face and the transparent case back and the luxury theme continues with the black alligator leather strap, which is fitted with an 18-carat white gold foldover clasp. Only the very best materials available are used in this exclusive Speedmaster, as a fitting surround for the spectacular skeletonised movement. The manual-winding OMEGA chronograph calibre 3604 is the result of countless painstaking hours of work by OMEGA’s most experienced master watchmakers. No less than 100 hours go in to the crafting of one single movement at the exclusive top-of-the-range workshop at OMEGA’s head office in Bienne, Switzerland. The steel components used in the movement are drawn, bevelled and polished by hand, the movement is skeletonised by hand and the decorative engravings are also done by hand. The watchmaker adds his own individual artistic touch to the decorations on the movement, making each watch unique and clearly distinguishable. Unique detailing complements the blued-steel hands and blued gold hour markers on the dial: the screw heads on the dial side are polished, whereas those on the bridge side of the movement have blued-steel heads. Furthermore, the calibre number is engraved on the chronograph bridge and each piece is individually numbered in red on the dial at 12 o’clock (01/57 – 57/57). The limited-edition OMEGA Speedmaster Professional Moon Phase models are produced entirely in-house at OMEGA’s specialist top-of-the-range workshop. This workshop is dedicated solely to the brand’s most exclusive timepieces and is notably responsible for production of the OMEGA Central Tourbillon – the only watch in the world with a central tourbillon cage, of which it produces only a handful each year. The same experience, feeling and minute craftsmanship that go into each Tourbillon are used for the limited-edition Speedmaster, representing the horological tradition of manufacture at its finest. In keeping with these traditional watchmaking skills, the OMEGA skeletonised Speedmaster Moon Phase retains one feature that dates from before the age of the computer: the tachometer scale on the bezel, which has stood the test of time and become a trademark of the legendary Speedmaster. 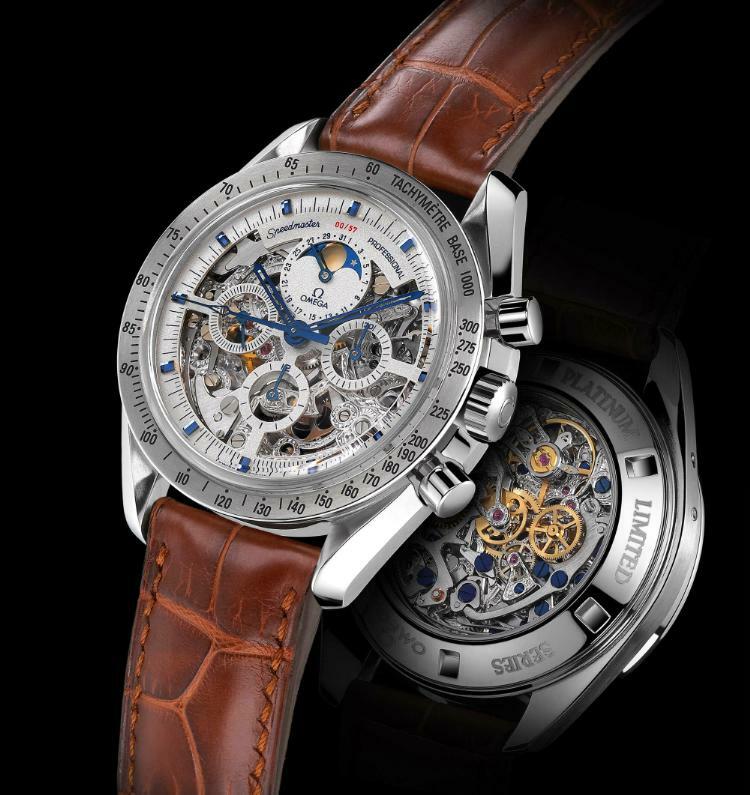 This entry was posted in Press Release, Speedmaster Professional and tagged 3688 30.32, Skeleton, Speedmaster Moonphase on April 3, 2003 by Dale Vito.